Posted on February 24, 2017 at 10:48 am. BetOnline has replaced GGL live games with ViG games. BetOnline has responded to cheating claims by dumping live software provider Global Gaming Labs (GGL). 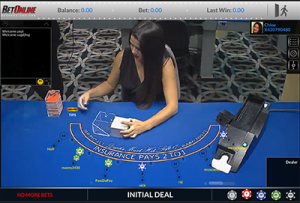 Following a live blackjack dealer at BetOnline allegedly caught cheating on camera, the company has released two statements addressing the claims. The first statement has revealed the third-party live dealer provider, GGL, has been dumped and replaced with live dealer specialists Visionary iGaming (ViG). “After client-side complaints regarding the number of available tables, games offered, lackadaisical dealers, and poor hand reporting became common-place (regarding GGL), BetOnline took on the task of finding a superior Live Casino Vendor,” the company said in a press release. The statement suggests complaints about the initial live dealer casino provider were occurring long before the action was caught on camera, which begs us to question whether this was a publicity stunt or if the issue was covertly on-going. “After a month-long search in early January 2017, it was decided that ViG would offer a superior product for the BetOnline.ag players,” the statement said. GGL has not commented on the situation. ViG live dealer games are now available at the all-in-one gambling site, with four live blackjack variants available, along with two roulette live games, and four live baccarat variants. The response has allegedly been welcomed, but many are questioning the motive behind how fast it occurred. BetOnline has also addressed the recorded incident in another statement, urging players to email the company if they feel they’ve been affected by the actions of the dealer in question. “BetOnline.ag is currently looking into the issue with help and careful cooperation from the previous Live Dealer provider,” the statement said. The incident took place on January 25 and recorded by self-proclaimed blackjack professional, Michael Morgenstern, who posted it to his YouTube account. He didn’t notice the indiscretion until someone posted a comment and pointed out the dealer had dealt the second card from the shoe instead of the top card on the deck. It was then discussed at length on the social forum Reddit, where many questioned why the dealer would partake in such a risky move. Many speculated whether it was enforced by GGL alone, or if BetOnline was in on it too. But others also indicated they’d never play live games at the site, and instead use it for sports bets only. While BetOnline has addressed the incident and replaced the third party live dealer provider, only time will tell if this was an isolated incident or other players had been cheated too. As this story proves, some live dealer operators are much, much better than others. We recommend only trusted online casinos such as Bovada Casino, which sources all of its real money games from licensed, industry-leading providers.